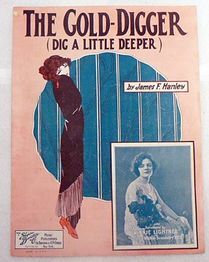 The Gold Diggers is a 1923 American silent film directed by Harry Beaumont with the screenplay by Grant Carpenter based on the 1919 play The Gold Diggers by Avery Hopwood. This is the first film in the Gold Diggers series. The film was released on September 22, 1923. The plot involves Stephen Lee objects to the marriage of his nephew, Wally Saunders, to dancer Violet Dayne because he feels that all chorus girls are gold diggers. Violet's friend, Jerry La Mar, who is not a gold digger, decides to vamp Lee so that he will see by comparison what an unselfish girl Violet is. Lee becomes fascinated with Jerry, and although he knows the truth, he marries her, approving at the same time his nephew's choice. 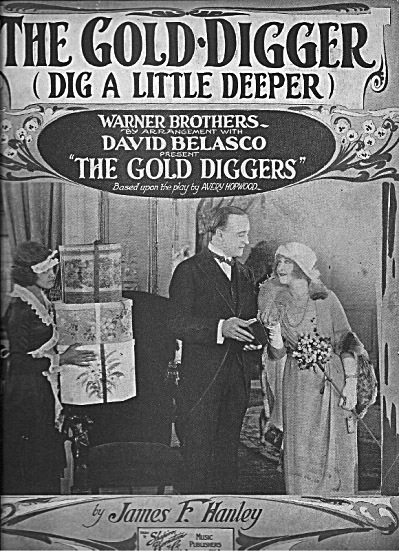 Along with the mostly lost 1929 film Gold Diggers of Broadway, the film is now lost. No copies of The Gold Diggers are known to exist. However, the film's soundtrack and a few stills survive. ↑ The film's summary at the American Film Institute Catalog. Retrieved 18 Jun '16.